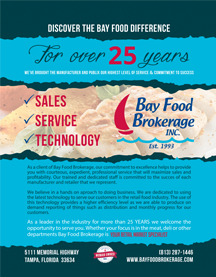 Bay Food Brokerage is dedicated to utilizing the latest technologies available to help serve our clients needs. Providing efficient service to our clients is and always been a very important priority to our company. Bay Food Brokerage believes in a hands on approach to doing business. We are dedicated to utilizing the latest technology to serve our customers in the retail food industry. 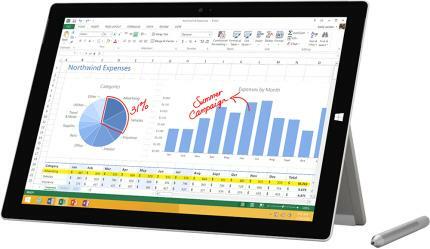 The use of this technology provides a higher efficiency level as we are able to produce on demand reporting of things such as current activities and monthly progress for our customers. Bay Food Brokerage representatives are in the field and maintain constant communication at store level, making in person store calls, meeting with department managers and key store personnel to ensure that every detail is covered. Our representatives are specifically trained to put technology to use as tools that allow us to maintain the level of personal service that we are known for in the industry. These techniques keep the manufacturers that we represent immediately informed of what is happening at retail levels. From a corporate level Bay Food Brokerage utilizes state of the art equipment, advanced computer operations and Microsoft technologies to manage our customers and representatives. This advanced technology allows our corporate offices to maintain a personal infrastructure to host our own data servers. This further increases the delivery of on demand reporting to our staff and representatives and allows our customers to have what is needed at the touch of a finger. Bay Food Brokerage has established a rigid protocol for monitoring store production and retail reporting. In cooperation with our in store representatives, our manufacturers can request information from Bay Food Brokerage team memberss at any time. We realize the critical importance of keeping ahead of competitors and we utilize the same protocols internally to assure compliant productivity.